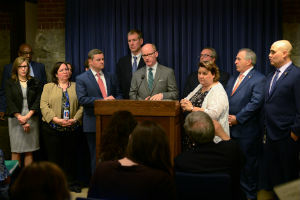 SPRINGFIELD – State Senator Don Harmon (D-Oak Park) joined Democratic and Republican lawmakers today to announce a new effort to tackle the issue of illegal guns being used in crimes in Illinois. The legislation, Senate Bill 337, incorporates portions of Harmon’s Gun Dealer Licensing Act, which Gov. Bruce Rauner recently vetoed, as well as provisions to better record and track private sales. 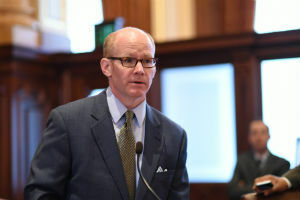 Harmon’s measure would require the Illinois State Police, rather than the Illinois Department of Financial and Professional Regulation, to certify dealers. The legislation also treats all firearm licensees the same, eliminating exemptions for small and large dealers to focus on their actions, not their size. To crack down on illegal transfers after a gun is purchased, the measure puts in place a penalty for individuals who fail to maintain a record of a private sale and requires State Police to make key information about guns used in crimes available to the public. • and requiring certified licensees to have their place of business open for inspection by the State Police and local law enforcement. Senate Bill 337 awaits action in the Senate. SPRINGFIELD – Legislation to decrease opioid dependence by increasing access to medical alternatives passed the Senate today. 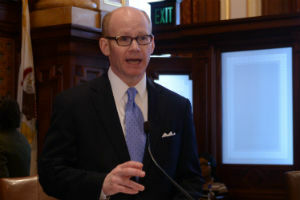 Senator Don Harmon (D-Oak Park) passed the Alternatives to Opioids Act out of committee earlier this year and worked closely with the Illinois Department of Public Health to address remaining concerns before bringing it to the Senate for a vote. The measure adds any condition for which opioids could be prescribed to the list of qualifying conditions for the state’s medical cannabis program, allowing individuals who might otherwise use an opioid to participate in the program. The legislation creates a pilot program that allows patients to take a physician certification to a dispensary to receive medical cannabis. Patients can participate in the program and use medical cannabis to help them transition off their initial opioid prescription or to treat their pain without ever using opioids. Dispensaries would be required to verify the physician certification and dispense medical cannabis in set amounts based on the recommended duration of the opioid prescription. The patient would be given an endorsement card indicating that they are in lawful possession of medical cannabis. Senate Bill 336 passed the Senate 44-6 with bipartisan support and will now head to the full Senate for consideration. 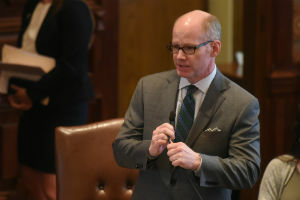 SPRINGFIELD – A poll released today shows that a majority of Illinoisans support Senator Don Harmon’s (D-Oak Park) plan to license gun dealers at the state level. The poll, conducted by the Illinois Gun Violence Prevention Coalition, found broad, bipartisan support for the Gun Dealer Licensing Act among suburban and downstate residents in areas viewed by some as less supportive of gun legislation. Overall, 71 percent of respondents favor state licensing of gun dealers with only 23 percent in opposition. 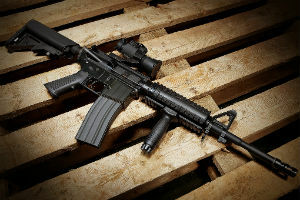 Support for the proposal was strong among downstate respondents (67 percent), West Suburban respondents (74 percent), Republicans (65 percent) and even among gun owners (63 percent). The Gun Dealer Licensing Act would allow Illinois to license gun dealers and encourage better business practices while holding corrupt dealers accountable. Studies show that a small number of gun dealers are disproportionately responsible for selling guns used in crimes. The measure passed the General Assembly with bipartisan support, but Gov. Rauner vetoed it last month. Harmon plans to move to override his veto in the coming weeks.